What to do with leftover mashed potatoes? Turn 'em into Smashed Potato Bombs! With a few ingredients, you can repurpose last night's dinner into a Gameday treat. I had a particularly large amount of mashed potatoes leftover recently. I knew I wasn't going to have them again the next day, but I knew that if I turned them into something else, I'd be able to freeze them and use them another time. Bingo! Smashed Potato Bombs! 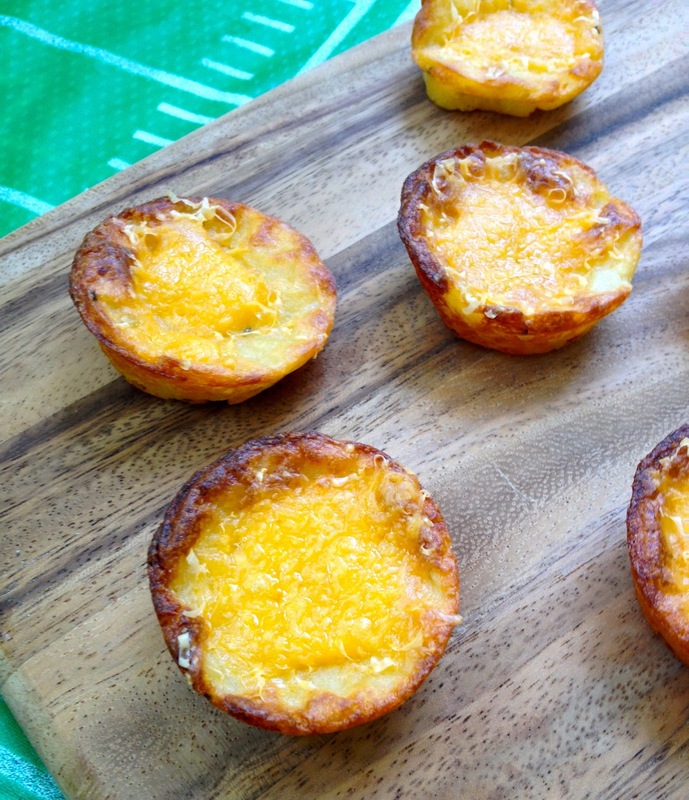 These little guys are crunchy and creamy and make perfect finger food for Gameday. I have a muffin tin that makes only muffin tops, which was perfect for this. I placed spoonfuls into each slot, placed a small thumb indentation in each and sprinkled a little bit of grated cheddar on top. If you don't have one of those tins, you can certainly just drop spoonfuls onto a sheetpan like cookies. Once they were done (and tested, of course! ), I let them cool off and froze them. On Gameday, I just reheated them at 350-degrees and they were great! 2. Mix all ingredients, except for 1/4 cup of the grated cheddar. 3. Scoop a small amount of the potato mixture into a shallow muffin tin. 4. Create a small indentation on the top of each potato "coin" and then fill the indentation in with a little bit of the grated cheddar. 5. Place in the oven and cook until the cheese is melted and the potatoes are golden - about 20 - 30 minutes. It can't get simpler than that! Let me know how you like it! Enjoy your games this weekend and keep on Homegating! Once in a while, you need to sneak some sweetness into your homegate menu. After gorging on spicy, savory and/or salty fare all Game Day, it's nice to have a little sweet treat to balance it all out. I wanted to take advantage of the wonderfully sweet peaches that I've been enjoying these past few weeks and make a little Peach Crostata to serve on Gameday. We're usually not big into sweets on Gameday, but once in a while someone will bring cookies or ice cream to have towards the end of the day. I always keep puff pastry in the freezer, so when I had an abundance of peaches not too long ago, I thought a crostata would be a nice way to go to use up those peaches and the puff pastry. The filling is light and not too sweet, which is why I happen to be a fan of this. All it's comprised of are peaches, honey, maple syrup, vanilla extract, cinnamon and a pinch of salt. You can't get any easier than that. 2. Place the honey, maple syrup, vanilla extract, cinnamon and salt in a small saucepan and heat through. Pour over the peaches and toss until thoroughly combined. 3. Roll out a sheet of the puff pastry onto a sheet pan and dock (pricking holes with a fork) all around leaving a 1/2" border untouched. 4. Arrange the peach slices on top of the pastry, leaving the 1/2" border. 5. Place in oven for 20-30 minutes until the pastry puffs up and is golden. 6. Bring to rom temperature and serve. So there you have it! Something a little different this time, but I think your guests will like the change. If you try it, let me know how you like it. Until next week, keep on homegating! I don't know why I hadn't thought of these sooner. It's so simple - it was right under my nose. But you see? It takes something else to trigger a little culinary inspiration. 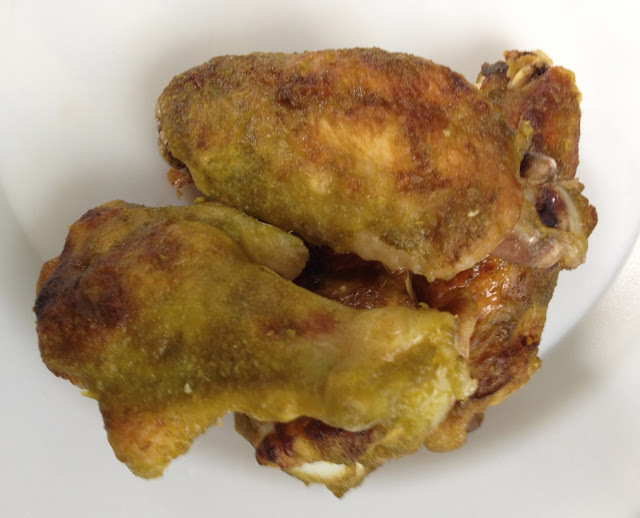 During a day of recipe testing, I came up with: Green Wings!! On this one particular recipe test day, I was on a food processor rampage. I was pureeing and making various little sauces. I was on a roll and kept thinking of what else I can puree and make into a sauce. I opened the fridge and spied a bottle of pickled jalapenos. Yaaassssss!!!!! I dumped the entire jar (juice and all) into the processor and whizzed it up. After taste testing and adding a few other ingredients, I knew I had a tasty, but spicy sauce to play with. But what to do with it? Oh yeah - baste it on some wings and let 'em fly! 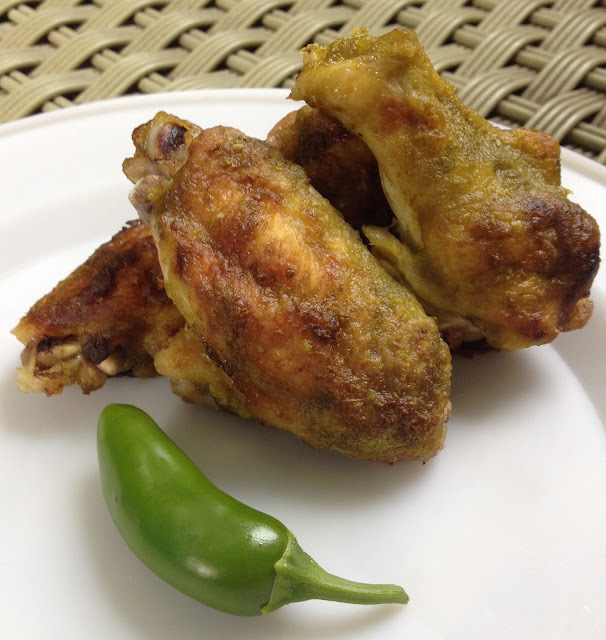 By the time the wings are finished roasting, they just look like roasted wings with a slight greenish tint. They have a nice bright flavor. They're not as hot as the red sauces, but they do have a little after-zing. I served the extra sauce on the side in case anyone wanted to add a little more to their wings. 2. Place all ingredients in the food processor and process until smooth. Reserve 1 cup of sauce. 3. Baste wings with sauce and place in the oven. Continue to baste the wings every 15 minutes for 1 hour. 4. 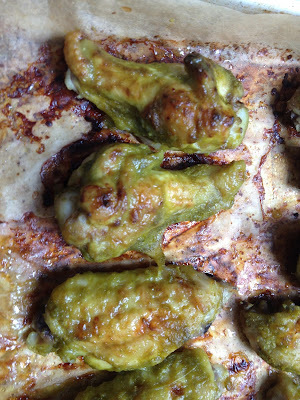 Remove from oven and serve with extra sauce. 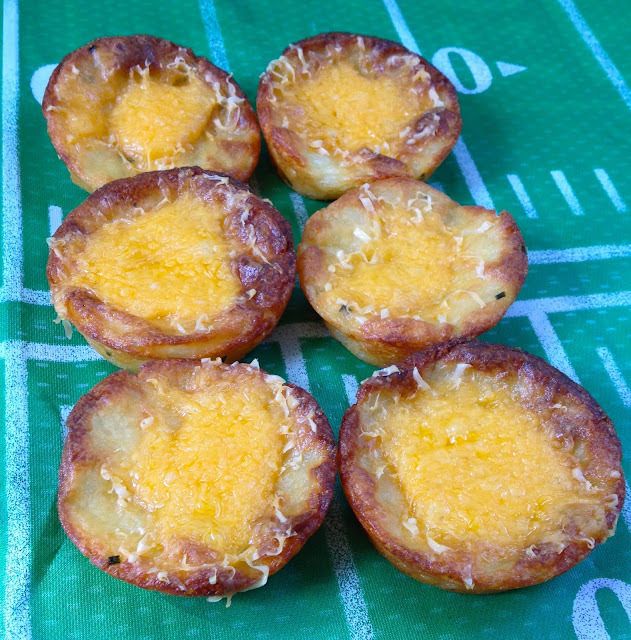 When I served these to the Gameday Gang, they were a little taken aback when they first looked at them. After all, people are used to seeing red wings. But of course they were psyched to check them out and they got some great reviews. Some liked them as is and some used the extra sauce to dip the wings into. Whichever way they ate them, the wings wound up disappearing, so I'm going to take that as a good sign. And there you have it! Try these guys out one weekend and see how your crowd digs 'em. Enjoy your games and I'll see you next week! Opening Day Kickoff 2016: Spicy Orange Meatballs!! Happy Kickoff 2016! Football is back!!! While the season is never really over on the internet, it still seems like forever since we watched Peyton raise the Lombardi. It seems like so much has happened since that night. Hey, even he's become a Homegater! But we are finally getting ready to start off another season with high expectations for our teams. Each team is starting out anew. For the Gameday Gang, Opening Day is cause for a double celebration this year. First of all, we're celebrating the first week of the season, and we're also celebrating the grand opening of our new Homegating101 Headquarters at the Garage Bar (aka: Fan Cave). While it's still a work in progress, it's been all prepped with the essentials: TV, seating, fridge, kegerator and various other accoutrements. We're psyched. It's going to be a fun gathering place for the gang to eat, drink and watch the games. So to start the season off in our new location, we're presenting: Spicy Orange Meatballs! I picked up some orange marmalade at a farm stand this summer and wanted to incorporate it into one of my gameday dishes. I figured it would make a nice sweet and spicy sauce. A combination of the marmalade along with some sambal sauce, rice wine vinegar and soy gives the sauce a nice sweet, savory and spicy tang. The sauce can work on any meat you might want to prepare, but I went with meatballs. You've got the deep savory flavor of the meatballs playing off the sweet and spicy orange sauce. It's a nice combination. 1. Pre-heat oven to 400-degrees. Mix all the meatball ingredients well and roll into golf-ball size balls. Place on baking sheets and put in oven for 25-30 minutes, or until meatballs are browned. Remove from oven and let cool. (NOTE: meatballs can be made ahead). 2. In a heavy saucepan on medium heat, melt down the marmalade until it become soft and liquidy. Add remaining ingredients and heat through until almost boiling. If the sauce is too thick, thin out with a little water. Place meatballs in sauce and stir to make sure all the meatballs get covered in the sauce. Heat through and serve. I have a small crock pot that I'll use to keep these meatballs warm. We have a table in the garage bar where we'll put all the food so that everyone can help themselves throughout the day - and I won't have to keep running back and forth to the kitchen to heat something up! That's the beauty of having warming trays and crock pots. Your hot food will stay hot all day. I have a football-shaped crock pot (of course I would!) that I use for hots dogs in water (who doesn't love a hot dog on gameday?). So there you have it. This recipe is easy to prepare. You can make the meatballs ahead. You can even freeze them and then thaw them out when you're ready to make the sauce. Hope you decide to try these. Let me know if you do and how you like them! Enjoy the games and good luck to your teams! Munch Madness '16: Matzo Pizza!! March Madness is upon us once again -- or as we here at Homegating Headquarters like to call it, Munch Madness! This is a crazy time of year with all the college games going on. Bracket mania is alive and well in all the offices. But unfortunately my bracket is already dead in the water due to a few shocking upsets. First time in a long time that I got bounced out of the action so early in the tournament. Oh well, that leaves me more time to concentrate on making something yummy for the Gang. This weekend I came up with a quick cultural mashup that got me in and out of the kitchen in no time so I can enjoy the b-ball action: Matzo Pizza. I love matzo. There's something about it's thin, crisp texture that I really enjoy. It's readily available this time of year, so I always have a box (or 2) of it in the house. A bit of insanity struck me and I thought it would make an interesting base for funky little pizzas. What the heck? How bad could it be? Well, it was pretty darn good and pretty darn different. Since you don't have any dough to stretch out, take the sheets of matzo and break them up into any size pieces that you'd like. Spread some pizza sauce, cheese and any other toppings you'd like and pop it into a 400-degree oven until the cheese is melted and bubbly. 1. Pre-heat oven to 400-degrees. Spread pizza sauce on each piece of matzo. Sprinkle shredded mozzarella over the sauce and add any other toppings you'd like. 2. Bake in oven until cheese is melted and bubbly. It's as simple as that. You're going to get a kick out of the crispy "crust" that the matzo provides. It's different, fun and yummy. Try it, I think you'll agree that it's slam dunk (did I just say that?). Good luck to all of you whose brackets are still alive. I'll have to wait until next year for any kind of victories in that regard. And good luck to whichever team(s) you are rooting for as well. Until next week, keep on Homegating! This weekend the Gameday Gang is coming over to catch some hockey and pre-season baseball. A few folks are coming over early to help me do some of the cooking beforehand, so I thought I'd whip up a little breakfast for them. Since most of the afternoon we'll be gorging on a little less-than-healthy fare, I thought I'd start the day out on a healthy note (counts for something, right?). 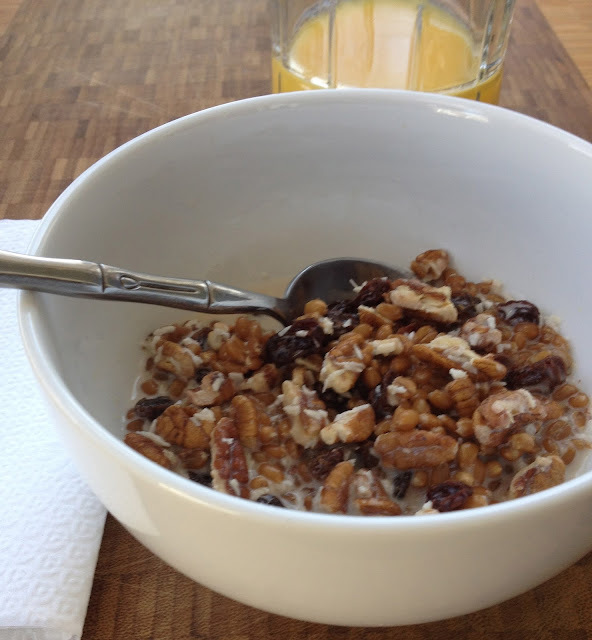 This Wheat Berry Cereal is hearty, healthy and a nice alternative to some of those sugar-laden packaged cereals. A wheat berry is the whole grain form of wheat - so it's not gluten free. It is however, high in protein, fiber and vitamins. It cooks in the same amount of time that rice would. You can find wheat berries in most health food stores. Besides the wheat berries, the cereal includes chopped pecans, raisins, shredded coconut, ground flax meal, vanilla and maple syrup. You can make a whole bunch ahead of time, fridge it and then just serve it with your milk of choice (we went all-in on healthy and used coconut milk). Combine all the ingredients and spoon into individual bowls. Serve with milk of your choice. You can also add some fresh fruit if you'd like. As I previously mentioned, it's a pretty hearty breakfast. Very filling and very tasty. I hope you've been enjoying some of your other teams' games. We've turned into puck heads watching our teams on the ice. We are also looking forward to some March Madness action and the upcoming baseball season. Lots to look forward to! Keep checking in for more gameday recipes! And keep on Homegating!! We're going a bit off topic this week, but I still have a great munchie for you that will go great at your homegate hangout anyway. Because tonight is the Oscars, the Gameday Girls decided to get together to pre-game with the Red Carpet show. Now let me tell you, you get a bunch of women together to watch the stars rocking some of the latest couture, that could be a sporting event in itself. I can guarantee you that a few of us will be throwing a few barbs at the screen, just as we would with a bad call. The only difference is that the drinks and munchies are a bit more, "sophisticated." Prosecco replaces beer and Eggroll Crackers replace tortilla chips. I had a package of eggroll wrappers in the fridge. Instead of making eggrolls with them, I decided to cut them into squares, brush them with a little olive oil and sprinkle a few herbs and spices over them. A quick pop in the oven and you have a crispy, savory cracker that you can enjoy alone or use as a dip vehicle. Enjoy! 1. Pre-heat oven to 350-degrees. 2. Cut eggroll wrappers into 4 pieces. Place on a sheetpan and brush each with olive oil. 3. Sprinkle each with some Italian seasoning, salt, pepper and grated cheese. 4. Place in oven and bake for 15 minutes - or until desired crispness. 5. Serve as is or with various dips. Can't get any simple - or as elegant as that! Now if you'll excuse me, I need to slip into my tiara and get ready for the Gameday Girls to arrive strutting their stuff on my non-red carpet. Enjoy and keep on Homegating! !